You've blamed your metabolism for your weight your whole life, right? Well, as you get older, your metabolism really does make it difficult to burn calories as efficiently as you did when you were younger. Metabolism is the amount of calories you burn at rest, or the amount of energy your body uses to function. The average 30-year-old woman burns 1,150 to 1,250 calories daily, while the average 30-year-old man uses 1,600 calories. After age 30, your metabolism slows down. The drop is slight - only half a percent a year - but it adds up. Continue to eat the way you did in your 20's, and you'll be consuming more calories than your body can use. Those extra calories become fat. Menopause, extreme dieting or inactivity can slow your calorie burn even more. The good news is you can rev up your metabolism. The best way is to exercise. Any activity, from washing dishes to running a marathon, speeds up the rate at which you burn calories. Not only does the exercise itself burn calories, but a good workout creates muscle, which burns calories more quickly than any other tissue. A University of Maryland study showed that after a 16-week strength-training programme, the resting metabolic rate of healthy 50- to 65-year-old men jumped 7.7 percent. And a University of Colorado study found that post-menopausal women who regularly swam or ran for at least 45 minutes five days a week maintained the same resting metabolic rate as younger, pre-menopausal women. Don't overdo calorie cutting. Putting yourself on a very low-calorie diet is a sure-fire way not to lose weight. Your body is programmed to defend your usual weight. So if you suddenly drop 1,000 calories from your diet, your resting metabolic rate (the number of calories your body burns to maintain basic bodily functions) will automatically slow down, because your body now assumes that you're starving. Eat breakfast. Believe it or not, it may be the most important meal of the day as far as metabolism (and weight loss) is concerned. 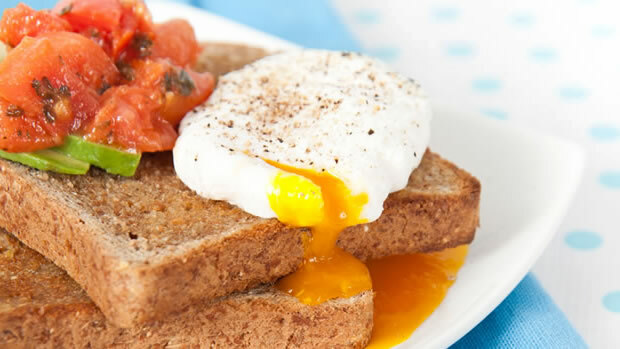 Breakfast eaters lose more weight than breakfast skippers do. Your metabolism slows while you sleep, and it doesn't rev back up until you eat again. So if you bypass breakfast, your body won't burn as many calories until lunchtime as it could. That's why it's smart to start the day with a solid 300 to 400 calorie meal. Pile on the protein. Eat plenty of protein and you boost your metabolism, burning an extra 150 to 200 calories a day. Protein is made up mainly of amino acids, which are harder for your body to break down than fat and carbs so you burn more calories getting rid of them. Nibble all day. It sounds counterintuitive; why would you eat continually if you wanted to lose weight? But eating five to six mini meals rather than three larger meals every day keeps your metabolism humming 24/7. It will also prevent you from going without food so long that you become so hungry you overeat. Try not to let more than four hours elapse between meals and make sure each meal includes protein, for an extra metabolic boost. If you eat a high-fibre breakfast of cereal and fruit, have a midmorning snack, such as yoghurt and fruit; lunch (try 100g of chicken or fish with a leafy green salad); another snack, like a banana and a piece of low-fat cheese, in the late afternoon; and a light dinner (100-150g turkey, salmon or another lean source of protein with steamed veggies). Skip alcohol. Thinking about having a cocktail or two before dinner? Think again. Having a drink before a meal causes people to eat around 200 calories more, several studies show. Drinking with dinner isn't such a good idea either: other research has found that the body burns off alcohol first, meaning that the calories in the rest of the meal are more likely to be stored as fat. If you do like to have a drink, stick to wine, which has only 80 calories a glass - or minimize the calories by drinking a white-wine spritzer (wine mixed with sparkling mineral water or soda water). Drink milk. Load up on low-fat dairy: Women who drank milk, yoghurt and cheese three to four times a day lost 70 percent more body fat than women who didn't eat dairy in a study published in the American Society for Nutritional Sciences Journal of Nutrition. The reason: Calcium, along with other substances in dairy, actually revs up your metabolism, according to study. Pump iron. Experts say weight training is the best way to crank up your resting metabolic rate. As you get older, your resting metabolic rate drops, but weight training can rev it right back up again. A pound of muscle burns up to nine times the calories a pound of fat does. Regular strength training can increase your resting metabolic rate anywhere from 6.8 to 7.8 percent. Don't think you have time to hit the gym? You can get great results with only two 15-minute lifting sessions a week. Research, published in the journal Medicine & Science in Sports & Exercise, found that doing just one set of 10 reps reaps about the same muscle-building benefits as three sets, as long as they're performed to muscle fatigue. Rev up your workouts. Adding interval training - bursts of high-intensity moves - to your workout is a great metabolism booster. Studies have shown that people who do interval training twice a week (in addition to cardio) lose twice as much weight as those who do just a regular cardio workout. You can easily incorporate interval training into your workout by inserting a 30-second sprint into your jog every five minutes or by adding a one-minute incline walk to your treadmill workout. Since your body is working harder, it's a more intense workout - and you therefore burn more calories. On other days, shake up your routine with 40 minutes of cross-training. Ideally, aim for two 20-40-minute interval-training sessions and two 20-40-minute cross-training sessions a week. Break up your exercise routine. Whenever possible, slice each of your workouts into two smaller sessions. For example, do a 15-minute weight-lifting session in the morning, then do your 30-minute walk on your lunch hour or at night. You'll burn an extra 100 to 200 calories that day. Don't have time? Just add in some stair climbing or short walks throughout the day. Even small bursts of activity are enough to get your metabolism revved, according to a study in the scientific journal Nature. For five minutes out of every hour, get up and do something, even if it's just walking around your office. You can end up burning a couple of hundred extra calories. Get some shut-eye. Skimping on sleep can derail your metabolism. In a study at the University of Chicago, people who got four hours of sleep or less a night had more difficulty processing carbohydrates. When you're exhausted, your body lacks the energy to do its normal day-to-day functions, which include burning calories, so your metabolism is automatically lowered. There are easy ways to get a good night's sleep, according to the National Sleep Foundation. Schedule your workouts earlier in the day; exercising within two to three hours of bedtime can keep sleep at bay. And try soaking in a hot bath, since studies show that warm water makes it easier to fall asleep. Chill out. Studies have found that long-term stress can make you overweight. When you're chronically stressed, your body is flooded with stress hormones, which stimulate fat cells deep in the abdomen to increase in size and encourage fat storage. This is worrying because fat deep within your belly is more likely to increase your risk for heart disease, diabetes and cancer. And stress hormones spark your appetite, making you likely to overeat.